Integration of Celltac chemi and a Celltac hematology analyzer will greatly improve measuring accuracy and enhance workflow efficiency. 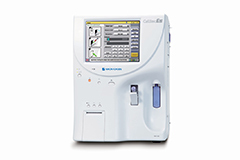 Celltac chemi can be connected to a Celltac hematology analyzer by cable, so hematocrit value from the Celltac hematology analyzer can be transferred to Celltac chemi for data compensation in the CRP value. Patient ID can be shared between Celltac chemi and the Celltac hematology analyzer, and CRP and HbA1c data can be printed on the internal printer of the Celltac hematology analyzer. EDTA whole blood tube can be used for both Celltac chemi and Celltac hematology analyzers and additional sample preparation is not required for HbA1c and CRP test. This reduces risk of infection and maximizes your lab’s productivity. The measurement cell already contains the correct amount of reagent. Each reagent cell has a QR code with lot information, expiry information and calibration curve which can be automatically scanned and registered into Celltac chemi. The reagent package is very compact (150 W x 120 D x 90 H mm, including 50 reagent cells) and saves storage space. Up to 4 past data for the same ID can also be displayed on the screen. This helps you check the data variation during HbA1c screening. The Celltac chemi CRP measuring range is 2 to 330 mg/L in whole blood mode and 2 to 200 mg/L in serum/plasma mode. The wide CRP measuring range contributes to accurate inflammation screening.